For several years, the Chevrolet Volt was the sole plug-in hybrid with electric range notably above 20 miles—though it became clear Chevy never figured out how to market its virtues to the public at large. Now it has a strong competitor in the form of the 2018 Honda Clarity Plug-In Hybrid, a mid-size sedan with five seats and a rated 48 miles of electric range that offers far more interior space than the Volt and equals its 42-mpg combined fuel-economy rating. We first drove the plug-in Clarity in December, and now we've had a chance to spend four days with it, covering 570 miles. By and large, our impressions of the Clarity Plug-In remain those we registered after our first drive event. Honda also thinks it's figured out how to explain the virtues of its plug-in hybrid; let's hope it's right. It's a large mid-size four-door sedan with a very pleasant and quiet interior, the range rating is fairly realistic, and its plug-in hybrid powertrain delivers a remarkable mix of electric smoothness and low fuel consumption for a car this big. We're not fans of the exterior styling, which stems from its origins as a hydrogen fuel-cell vehicle. That led to its high, bulbous tail, which had to accommodate large, transverse high-pressure hydrogen fuel tanks. The Clarity was subsequently adapted into an 89-mile battery-electric version that's effectively a compliance car, and the plug-in hybrid model that we tested. It will represent the bulk of Clarity sales of about 25,000 a year going forward. 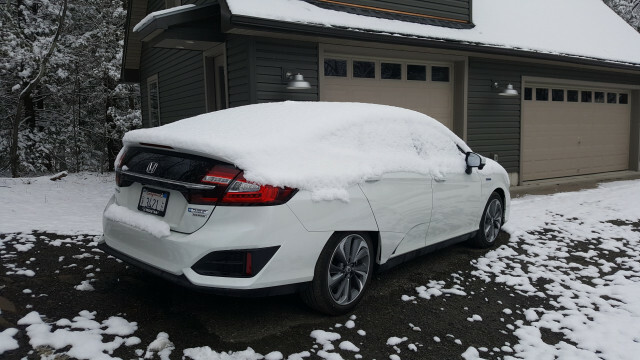 While December's first drive was in the temperate Napa Valley wine country, our four days with a white plug-in Clarity saw temperatures from 30 degrees F into the mid-50s F, including two unexpected snowstorms. 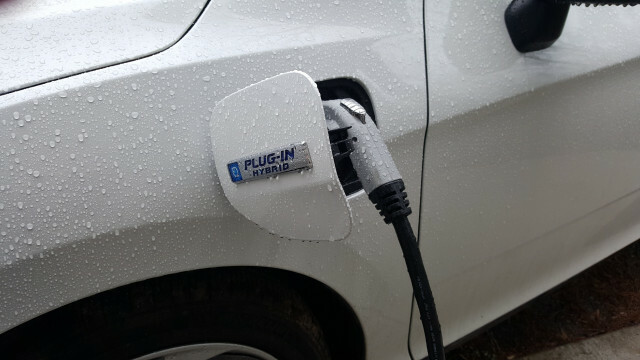 We were still able to get 30 to 48 miles out of a fully charged battery, depending on temperature but even more on speed, with highway speeds chewing up miles far faster than indicated range. With an expanded version of our customary test cycle of two-thirds highway miles and one-third city and suburban travels, we were able to observe the Clarity at highway speeds both in all-electric mode and then as a hybrid with the long-range battery depleted. 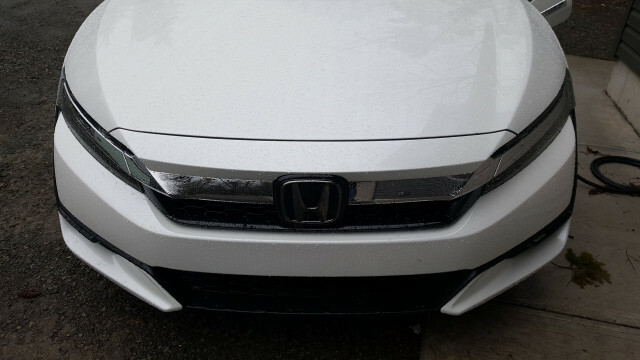 A set of hilly back roads in the Hudson Valley—hillier even than Napa Valley—also gave us a sense of how the car's plug-in hybrid system and its small 1.5-liter 4-cylinder engine coped with maximum power demands on steep hills. Overall, we covered almost exactly 40 percent of our 507.4 miles on grid power, despite having not one but two 115-mile highway runs. 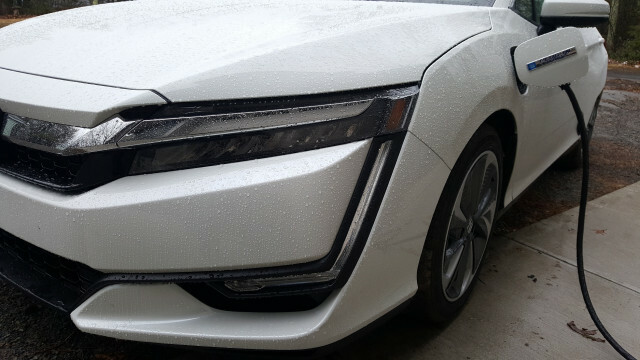 Our 2018 Honda Clarity Plug-In Touring model carried a base price of $36,600, no options at all, and a mandatory delivery fee of $890, bringing the bottom line on the sticker to $37,490. The car qualifies for a $7,500 federal income-tax credit, a $1,500 California clean-car purchase rebate, and a $1,700 rebate in New York state, along with various other state, local, and corporate incentives. In that respect, it largely matches the Chevrolet Volt. But it's got the extra seat and a larger and more luxurious interior the Volt doesn't. When we gave the Volt our Green Car Reports 2016 Best Car To Buy award, we said it was so good we'd consider buying one ourselves. There's a good chance we'd now transfer that nod of approval from the Volt to the Clarity Plug-In, despite 5 fewer rated electric miles.